Copper Foot BowlsCopper is used mainly in healthcare facilities, where harmful viruses, bacteria, and fungi colonize and persist on doorknobs, railings, tray tables, tap (faucet) handles and many other tools and equipments. Copper has proven that Antimicrobial anti contamination Copper continuously kills bacteria, never wears out, and is safe to use as copper surfaces prevent serving as reservoirs for the spread of microbes. These microbes can often survive on surfaces for long periods of time. 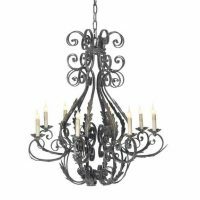 Dimensions: 28X 28X 34 inches Our wrought iron chandeliers are hand forged in small workshops by master Egyptian Blacksmith whose artistry and skill in Old World hand forge techniques bring an attention to detail and quality not available in factory mass production. Our designs and quality craftsmanship are hand made in different styles and ideal for your home, building, office, ranch or villa. 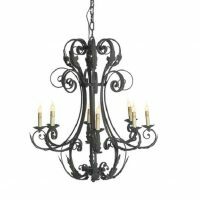 Please Note: Due to the Artisan Crafted nature of our chandeliers, dimensions may vary. Bulbs, sockets and wires are not included Buyer will need to wire the chandelier according to the US or destination electric standards by a professional electrician. 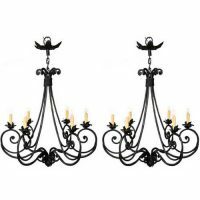 Category: Iron Chandeliers. 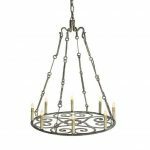 Tags: candle iron chandelier, chain scrolled iron chandelier, entry wrought iron chandelier, European hand forged iron chandelier, foyer chandelier, hall chandelier, hall fer forged chandelier, Large iron light chandelier, oversize iron chandelier. 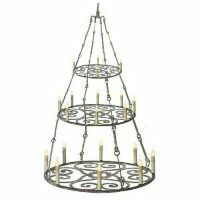 Used as a Candelabra or have it Wired. 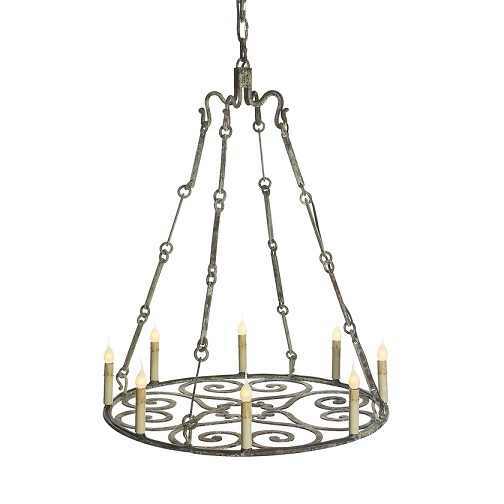 Durable Hand Forged Solid Wrought Iron. Unfinished. Original Rustic Raw Iron. Custom Made Designs Modifications are Welcome.